Activation problems with Windows 10 are a headache that neither Microsoft nor its users need right now. A glitch with Microsoft’s activation servers appears to be disrupting many users's PCs, as Windows 10 erroneously reports their systems as either un-activated or downgraded from Windows 10 Pro to Windows 10 Home. Users are advised to ignore the Windows messages and wait for the problem to resolve itself, according to postings in Microsoft’s support forums. If those forum postings are accurate, however, the problem could take a few days to resolve. Microsoft has acknowledged the problem. “We’re working to restore product activations for the limited number of affected Windows 10 Pro customers," Jeff Jones, a senior director at Microsoft, said in a statement. 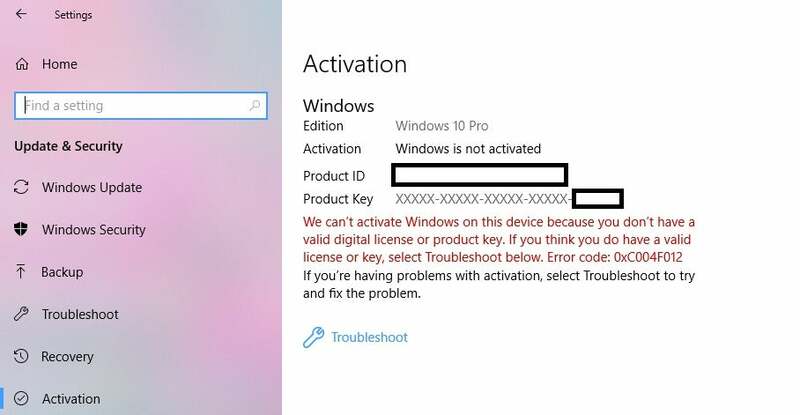 The problem has prevented some users from upgrading from Windows 10 Home to Pro, and worried others that they may have involuntarily purchased a fraudulent license key. Microsoft’s support forums are filled with complaints and concerns from users, without an official response from Microsoft. You may see this error message if Windows thinks that your copy of Windows 10 isn't activated. Clicking the "troubleshooter" link at the bottom may help. Microsoft does seem to be working on the problem, though. If you go to Settings > Update & Security > Activation, you’ll see a blue Troubleshooter link at the bottom of the page. Click it, and Microsoft will attempt to discover the source of the problem. Fortunately, in my case, it worked—though there's no guarantee you’ll have the same luck, unfortunately. Why this matters: Although this may end up being all for naught, Microsoft certainly doesn’t need any showstopping bugs right about now. Microsoft’s Windows 10 October 2018 Update has yet to ship (it’s now early November, of course) and the company has come under fire for shipping new features without ensuring they’ll work correctly. Telling users that their PC is unlicensed, or that they can’t get all the features of Windows 10 Pro that they paid for? Absolutely no one needs that stress right now. Updated at 4:50 PM with additional comment from Microsoft. This story, "If your Windows 10 PC says it's having activation problems today, here's why" was originally published by PCWorld.